Every time I see adverts in the newspaper for croft registrations, I get annoyed. Crofters are paying for the dereliction of duty by the Crofters Commission for generations – I will refer to the registration fee as the Crofters Tax from now on. 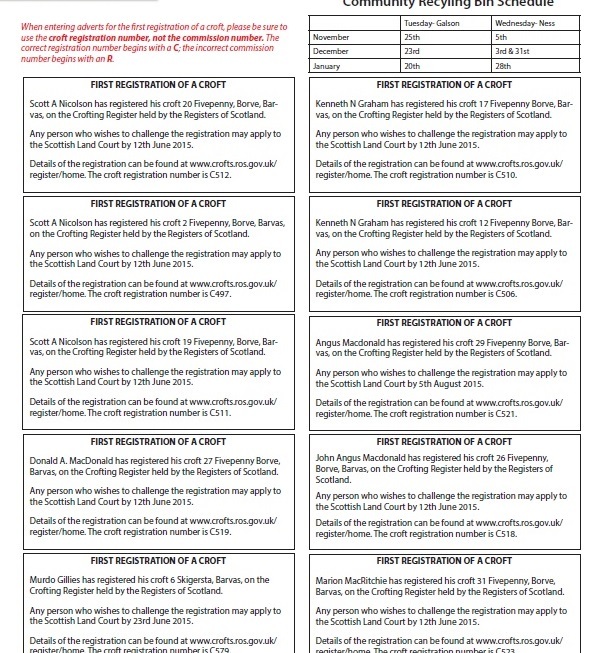 In the Ness paper, Fios, today, I counted 16 applications to register crofts. Lets do the sums: each registration costs £90 and at least £36 to advertise. (90+36) x 16 = £2016. Two thousand pounds out of crofters’ pockets just like that, and nearly £1500 of it leaving the fragile local economy. What do we have to show for it? Nothing but a pain in our backsides from sitting filling in the paperwork. You also may have to get assistance with the mapping as well, which will come with additional costs. The main reason I am annoyed by this tax is that it is all mapping work that the Crofters Commission should have been doing over the years and now you can barely do anything with a croft without going through the tax process. Scrap the Crofters Tax and get bureaucrats to do the jobs they were supposed to be doing all along.